Last week, we saw the release of Sago Mini Sound Box, the first app from Sago Sago. If you loved it, I’m pretty sure that you would love their next app even more. It is due for release tomorrow, but I was fortunate enough to have early access to the app which allows me to share my review with you. 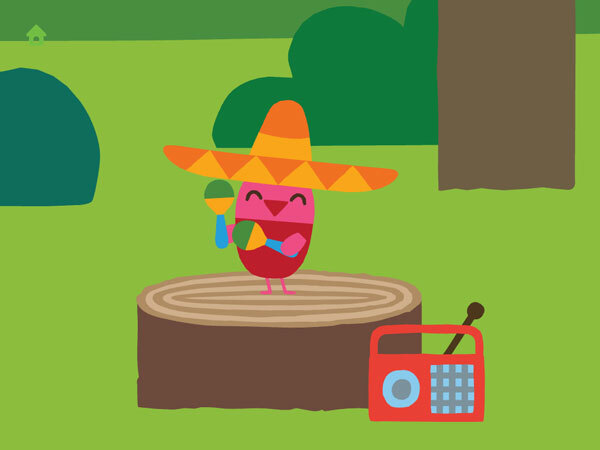 Sago Mini Forest Flyer is a fun little app that lets you explore the forest with a pink bird called Robin. To start the adventure, you need to wake her up by knocking on her birdhouse door or by pulling the bell that hangs in front of her door. She would then peek through her window curtain and be surprised to see you. Then, you can have her fly around the forest. You can drag around or tap to get her to a location on screen. As you fly through the forest, you will find more than 20 activities. The location for each activity is indicated by a subtly blinking yellow dot as you fly near it. These activities are optional, so you can play in any order, and revisit them anytime. There are many types of activities that you can find in the forest. Some activities are purely for fun; for example, you can fly Robin high above the trees and pop balloons. You can also find her dancing to tunes from an abandoned radio, or even play with the swing that’s hanging on one tree branch. In another activity, you can play drums with a set of mushrooms, and use a big hole in a tree to play peek-a-boo. Some other activities are designed to introduce you to Robin’s character. For example, you can find many occasions where Robin can’t seem to withhold herself when it comes to exotic food. She slams her head into a cupcake, and eats a red chili without realizing how hot it’s going to be. The app is designed to be an open-play environment where your juniors can explore the forest on their own. On the other hand, it’s also designed to let you accompany your juniors as they play. Based on my experience accompanying my three-year-old Philip as he played with the app, your juniors would encounter a few things that are new to them. And, that's where you come in: to answer their questions and trigger interesting discussions with them. For example, in one of the treetops, you can find a spot where Robin reads a newspaper. Depending on how old your juniors are and whether you have newspaper lying around your house, newspaper can become a new thing for them. Since I haven’t had any newspaper in my house for the past seven years, newspaper is quite a new thing for Philip. Another example is when Robin pretends to be a woodpecker. Again, depending on how well-versed your juniors are about animals, they might question why a woodpecker would hammer on trees. This is especially true if your juniors have been living in cities or areas which are far away from the forest, and they haven’t been exposed to Woody Woodpecker cartoon. Sago Mini Forest Flyer is a fun and beautiful app. It has smooth animations for all of its activities. The app feels very polished. The forest is designed to be circular, thus flying to the left or right far enough would take you back to where you started from. This allows juniors to explore the app endlessly. I also like how the activities are designed to let us learn about Robin’s character. She really is a fearless young bird with relatable behaviors. For example, she would look around to make sure no one would see her fart and poop. She would stand on top of a stone without realizing that it’s actually a turtle shell. She also sneezes when something tickles her nose. Just like any junior, she gets shocked when a set of eyes pops up when she tries to look inside a tree hole. Both my sons play the app whenever they can get their hands on the iPad. And, they tend to repeat their favorite activities. My one-year-old Noah loves flying and popping balloons the most. He would fly across the screen, pop the balloons, and count from 1 to 10. On the other hand, Philip loves to see Robin read the newspaper. I guess I need to get him a real newspaper one of these days. Sago Mini Forest Flyer is an awesome app for juniors ages 1-4 to play with Robin the bird and explore the forest. It’s a safe environment where they can start their own adventure and learn how to become an explorer. There are plenty of other fun and interesting activities that I have not covered in this review, but I’m sure your juniors would have a lot of fun exploring the forest and finding a few surprises along the way. Cocoons and Caterpillars. Follow Stella and Sam’s animated adventure with nature’s colorful shapeshifters.